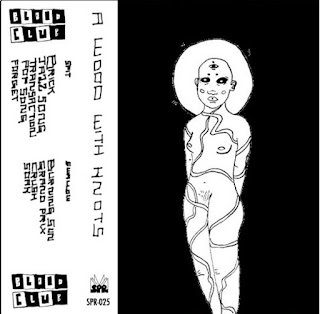 The Le Sigh: Premiere: Blood Club - "Jazz Song"
Premiere: Blood Club - "Jazz Song"
Listen to a new song off Blood Club's forthcoming album A Wood With Knots. I was very calculated when I sat down to write about Blood Club’s new album, A Wood With Knots. My body woke me up around sunrise and I posted at my window-facing desk, fan blowing. I lit incense. I made a pot of hot coffee on an 80-degree morning. What I realized staring at my laptop was that it takes more than a few routine comforts to produce something remarkable. For Liana Hell Lean, it took about half a decade of breaking down the walls of anything resembling a comfort zone not only for themselves, but their audience as well. The latest single from the dense 9-track album is “Jazz Song,” a melodic retreat, a virtual reality simulation dropping you into a drippy Dali painting. A little less industrial than their last single “Burning Sun,” “Jazz Song” emulates the woody pings of a rain stick behind prominent, echoed vocals. Hell Lean’s voice isn’t always at the forefront of their songs, which makes “Jazz Song” sound out all the more. These aren’t just beats from synthesizers and drum machines, but a “culmination of feelings and textures,” says Sister Polygon, the D.C.-based label releasing the tape. With the thoughtful dissonance of M.I.A.’s Kala and softness of The Blow’s Poor Aim: Love Songs, A Wood With Knots has a VIP spot under the roomy umbrella of the “punk” label. As vague and broad as that may sound, and as welcoming and simultaneously unwelcoming the seemingly monolithic punk genre may seem sometimes, in this particular case the punk spirit of Blood Club is manifested through travel: their sounds move from city to city, whether on tour or by way of Hell Lean’s own residences between Boston and New York. The liberating power of punk survives when it is mobile, and as long as Blood Club remains on the move, the community and genre at large will continue to see nuance. A Wood With Knots will formally release through Sister Polygon Records on July 14. Listen to Blood Club on bandcamp.